Sen. Jeff Flake, a Republican member of the Judiciary Committee, urges the panel not to act immediately on the Supreme Court nominee. WASHINGTON — The White House on Sunday stood by Supreme Court nominee Brett Kavanaugh after a woman publicly accused him of committing sexual misconduct decades ago, while a Republican member of the Judiciary Committee joined Democrats in urging a delay in the confirmation process. In an interview with The Washington Post, Sen. Jeff Flake, R-Ariz., said the woman, Christine Blasey Ford, “must be heard” and urged the committee not to vote on Kavanaugh’s nomination until it has a chance to hear more from her. “I’ve made it clear that I’m not comfortable moving ahead with the vote on Thursday if we have not heard her side of the story or explored this further,” said Flake, who is one of the committee’s 21 members. Republicans hold a 11-10 majority on the panel. Flake would not specify exactly what form the communication with Ford should take or how he would vote at this point in time. But he emphasized how much the allegations matter to him. Maine Sen. Susan Collins told a CNN producer while she was walking through Ronald Reagan Washington National Airport on Sunday that she was “very surprised” at the accusation against Kavanaugh, and she referred to an hourlong conversation she had with him on Friday. “It’s an issue that I brought up with him last Friday and he denied,” Collins said. On Friday, Ford had yet to be named in a story or be interviewed, but the contents of a letter outlining the incident became public. When asked if the committee vote should be delayed, Collins said she would be “talking with my colleagues,” and declined to comment further. The White House said Sunday that it is not withdrawing its nomination of Kavanaugh. A vote in the Senate Judiciary Committee remains scheduled for Thursday. Sen. Lindsey Graham, R-S.C., said he agreed with the committee’s concerns about the “substance and process” regarding the woman’s allegation – although he said he would “gladly” listen to Ford if she wanted to talk to lawmakers. The comments signaled that Republicans planned to move ahead and try to confirm Kavanaugh by the end of the month, even as Senate Democrats in leadership and on the committee swiftly called for them to delay a vote to advance Kavanaugh’s nomination. “To railroad a vote now would be an insult to the women of America and the integrity of the Supreme Court,” Senate Minority Leader Chuck Schumer, D-N.Y., said in a statement. The Washington Post published a story Sunday afternoon that included an on-the-record interview with Ford. The report marked the first time her identity had been revealed publicly and her first public comments about the allegation. Kavanaugh “categorically and unequivocally” denied the accusation in a statement. The allegation injects uncertainty into the prospects for President Trump’s second nominee for the court, roils the midterm elections with a record number of women seeking elected office, and carries high-stakes implications for the court. If the White House withdrew the nomination or Kavanaugh bowed out, the Senate would not have enough time to confirm a justice before the start of the new court session Oct. 1, leaving it with eight justices as Anthony Kennedy has retired. The court operated with eight for almost a year after the February 2016 death of Antonin Scalia and Republicans’ refusal to consider President Barack Obama’s nominee Merrick Garland. Any nominee may have to wait until after the midterm elections, with increasing signs that Democrats could capture the Senate majority. Senate Republicans had argued that how red-state Democrats voted on Kavanaugh would be a factor in their re-election. Without the nominee, the issue disappears. If Republicans press ahead with the nomination despite the allegation, they face a potential backlash from female voters, especially suburban women. In 1992, outrage over the Senate confirmation of Justice Clarence Thomas despite allegations of sexual misconduct from his former colleague Anita Hill, led to the election of dozens of female candidates. Twenty-six years later, the Senate is considering another Supreme Court nominee in the #MeToo era where allegations against prominent men in business, the media and Congress have cost them their jobs. As Democratic senators quickly responded to the report Sunday afternoon, many Republicans remained quiet. Foy said the committee vote has not been rescheduled. The developments marked the latest chapter of a long-contentious battle over Trump’s nominee that has grown increasingly divisive as it approaches its final stages. Hours before The Washington Post report was published Sunday, a centrist Democratic senator and two of his Republican colleagues argued that the allegation against Kavanaugh – which at that point Ford had not confirmed publicly – should have been raised sooner in the Senate and predicted it would not prevent the chamber from moving forward with Kavanaugh’s nomination. In televised interviews, Sens. Doug Jones, D-Ala., Thom Tillis, R-N.C., and John Neely Kennedy, R-La., expressed concerns that a letter outlining the allegation that Sen. Dianne Feinstein, D-Calif., received was not shared with fellow lawmakers earlier in Kavanaugh’s nomination process. The California Democrat also penned an op-ed published in the Los Angeles Times on Sunday formalizing her opposition to Kavanaugh’s nomination and briefly referencing her decision to share the letter’s contents with the FBI. The contents of Ford’s confidential July letter received widespread public attention in news reports the past few days. But they also triggered many questions, some of which Ford addressed in her interview with The Post. 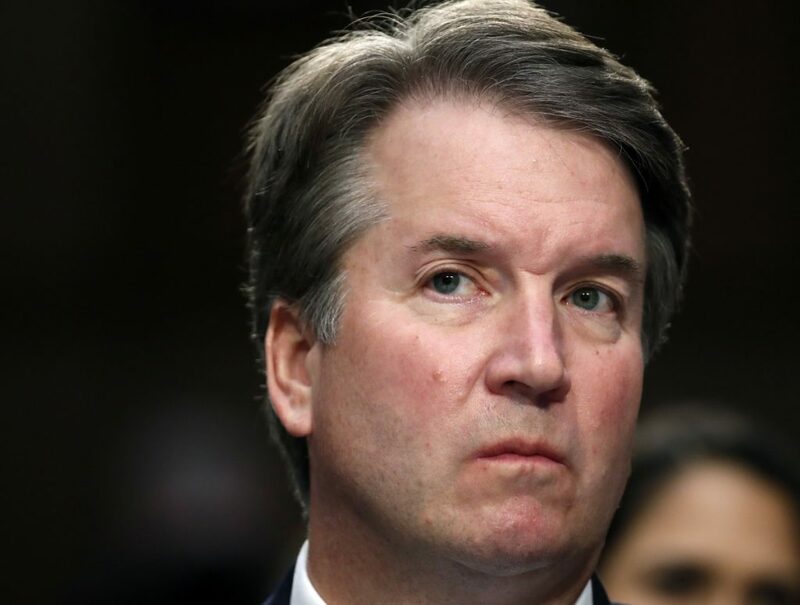 Ford told The Post that one summer in the early 1980s, Kavanaugh and a friend – both “stumbling drunk,” Ford alleges – corralled her in a bedroom during a gathering of teenagers at a house in Montgomery County, Maryland. Jones, a potentially key swing vote who has not announced whether he will support Kavanaugh’s nomination, said earlier Sunday that he hoped to meet with the judge and intended to raise what he called the “very serious allegation” with him if they are able to speak. “This was a very brave step to come forward. It is more important than ever to hit the pause button on Kavanaugh’s confirmation vote until we can fully investigate these serious and disturbing allegations. We cannot rush to move forward under this cloud,” Jones said in a tweet following The Post’s report. Senate Republican leaders have been aiming to confirm Kavanaugh before the high court begins its fall session next month. Tillis, who is a member of the Judiciary Committee, said Sunday morning that he was “shocked” that the allegation was not raised during Kavanaugh’s public or private confirmation hearings. He said he has not seen the letter and planned to seek more information about the timing of its release. Tillis said he thinks Kavanaugh will win confirmation by the Senate. “The questions that we will ask and seek answers to next week are, ‘Why sit on it for weeks?’ We understand that the person who wrote the letter is not willing to come forward. So we have a confidential witness not willing to sit down at least in a closed setting – that’s problematic to me,” Tillis said on CBS’ “Face The Nation,” speaking before Sunday’s report by The Post. He said he puts “some weight” on Kavanaugh’s denial. Kennedy, who also sits on the committee, singled out Feinstein for criticism before Sunday’s report in The Post. Collins, a pro-choice Republican, has remained undecided on whether she would vote to confirm Kavanaugh, while Maine Sen. Angus King, an independent who caucuses with the Democrats, announced last week that he opposes the nominee. Collins and Sen. Lisa Murkowski, a pro-choice Republican from Alaska, have been targeted by progressives as possible “no” votes on Kavanaugh, although Collins has also made many positive remarks about the nominee. Collins and Murkowski have broken ranks with their party in the past, including during the failed Republican effort to repeal and replace the Affordable Care Act last year. Press Herald Staff Writer Joe Lawlor contributed to this report.